Peonies are herbaceous perennials that have few rivals for their floral display and foliage. Their exquisite, large blossoms, often fragrant, make excellent cut flowers and the foliage provides a background for annuals or other perennials. There are four types of peonies that are generally grown in the home landscape; the woodland peony (Paeonia japonica), the woody tree peony (including Paeonia suffruticosa), the garden or herbaceous peony (Paeonia spp. hybrids), and the intersectional peony (also known as the Itoh, a hybrid of the garden and tree peonies). Single forms have centers of pollen-bearing stamens. Centers of semi-double forms consist of broad petals intermingled with pollen-bearing stamens. Double types have dense centers of only broad petals (transformed stamens). The anemone form, often included in the semi-double category, may have more than one row of guard petals encircling a center of thin, petal-like structures. Japanese types are similar to anemones but have staminodes (stamens that do not produce pollen) in their centers. The overlapping bloom time of the four varieties usually begins in late spring with the white-flowered woodland variety for 2 weeks, then the tree peonies for two weeks, followed by 2-3 weeks of the herbaceous and then finally two-three weeks of the intersectional hybrids. By selecting and planting early, mid- and late-season bloomers, flowering may be extended for six-eight weeks. Flowers are available in almost every color except blue. Peonies grow from two to four feet in height. Support in the form of metal peony rings is often required for tall, double hybrids although tree and intersectional varieties don’t usually need support. They have lush green foliage. In addition to the beauty that peonies bring to a landscape they also serve a beneficial purpose. The extrafloral nectar that is secreted from unopened peony flower buds attracts the beneficial Spring Tiphia wasp, Tiphia vernalis. T. popilliavora, the Summer Tiphia, feeds on the nectar of the wild carrot. These wasps parasitize the grubs of the Japanese and Oriental beetles by laying their eggs on the side of the developing grubs. When the larva hatches it attaches itself securely to the side of the grub and begins to feed on it, subsequently causing the death of the grub. The UConn IPM page Ornamental plants that help the natural enemies of white grubs has additional information. Peonies thrive in full-sun locations (8 hours or more a day) and will tolerate part shade (such as 5-6 hours of daily sun) although they may produce fewer blooms. Peonies prefer fertile and well-drained soils. They do not like to have wet feet as the roots will rot quickly in poorly drained soil so heavy clay soils are a poor choice. Conversely, soils that are proportionately high in sand will drain too quickly. The best growth is in soil with a pH range of 6.5 to 7.5, deep and rich in organic matter. They are hardy from zone 9 to zone 3 with some exceptions. Peonies require winter cold to flower and need a minimum of 6 weeks of temperatures below 40°F. Flower catalogs and online suppliers will provide a rating for the number of chilling hours required for each cultivar. This is not generally an issue in Connecticut where the zones range from 7a to 5b. For a simple border with all season color, they may be planted with spring flowering bulbs and with iris, day lilies, chrysanthemums, and hardy asters. Peonies are a versatile perennial and make good background plants for low annual flowers. To encourage flowering, plant on a northern exposure and do not mulch in the winter. Flower size will decrease due to root competition from nearby trees and shrubs. The planting site should have protection from strong winds, but be well aerated to reduce diseases problems. Try to avoid locations where peonies have been grown before. Planting, transplanting, or dividing peonies is best done in early fall but may be done in spring as soon as soils are workable. Tubers planted in the spring may not bloom until the following year. Allow at least two feet between dwarf varieties and four feet between standard varieties. Start with a soil test from the UConn Soil Nutrient Analysis Lab so that any amendments may be added at planting. Soil test every 3 years to monitor for essential nutrients. 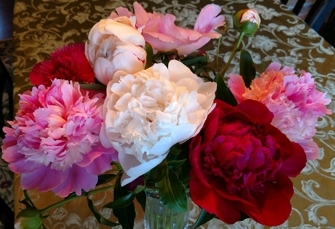 Peonies do not require much fertilizer and excess nitrogen will actually decrease blooms. Add 1/4 to 1/2 cup of 5-10-10 fertilizer per plant in the bottom of the hole. Avoid adding fertilizer to soil that will surround the roots but instead place amendments in the soil that will be a few inches below the tuber as the deep roots will grow down into it. A half cup of bone meal or superphosphate may also be added at planting. Dig a generous hole, large enough to accommodate the roots and incorporate aged organic matter in the bottom. Peonies are generally sold as bare-root tubers, select only specimens that are firm and free of rot. Soft spots may be trimmed with a knife. Place the tuber in the prepared hole so that the eyes (small, red-colored buds) are one to two inches below the soil's surface. Planting too deeply will prevent the plant from blooming. Backfill and water well. A light layer of mulch may be applied to conserve moisture and minimize weeds. Plant a tree peony tuber with 4 to 5 inches of soil covering the graft. The graft can be recognized by the ridge on the stem and a difference in bark texture. Deep planting allows the graft to develop its own root system. To produce larger flowers, a practice known as disbudding is recommended. The terminal bud on each stem tip is left and all side buds are removed. This should be done as soon as the buds are visible. Cutting flowers for enjoyment in the home can reduce the flowering in future years. Do not cut more than one-third to one-half of the flowers for cut flowers and leave as much foliage as possible on the plant. Do not fertilize peonies in the late summer or fall. Remove faded blooms to prevent seed development by cutting the stem down to a set of leaves within the foliage so that bare twigs are not sticking out. Cut down peony foliage to 3” once it is damaged by a hard frost. Do not cut back tree peonies. Remove any mulch that was applied during the growing season along with fallen foliage to remove diseases that may overwinter in them. Only first-year plantings require mulching during the winter months. Peonies may be left undisturbed for many years. A decline in flower production usually indicates overcrowding and the need for division. Carefully lift the clump and wash away the soil to expose the eyes. Using a clean, sharp tool, divide the clump into sections, each with three to five eyes and good roots. Replant immediately. Botrytis blight (a.k.a. gray mold) is caused by a couple of species of fungi in the genus Botrytis. These fungi are found throughout our area and the infection of plants is favored by cool, wet conditions. Symptoms may include death of young shoots and flower buds, blighted leaves, or flowers. Affected plant parts will be covered with a brownish mass of ‘fuzzy’ looking spores during humid weather. Spores are rain splashed or wind-borne to new infection sites. Control practices for this and other fungal diseases of above ground plant parts include sanitation, moisture management and fungicides. Sanitation includes removal of severely infected plant parts or plants and a thorough clean-up of debris at the end of the season. Minimizing humidity and leaf wetness reduces opportunities for spores to germinate and infect the plant. Avoid overhead irrigation or, if used, water early in the morning. Space plants to allow for good air circulation between them. If necessary, protect plants prior to wet weather with a properly labeled fungicide. Biological, biorational and conventional options are available for home gardeners. A number of fungi and a bacterial pathogen can sometimes cause leaf spots or blotches on peony. These are all spread by splashing rain or irrigation water so as with Botrytis, moisture management, including not working among the plants when wet, will help reduce spread. In most cases, if spots occupy about 30% or less of the leaf surface area, plant health will not be affected. Clean up diseased debris well at the end of the season and do not add to your compost pile. If the problem appears serious enough to warrant the use of control products, an accurate diagnosis would be helpful for product selection. This is because not all fungicides will be effective for bacterial diseases. One option would be to select a product that is labeled for both groups of pathogens. If peonies are planted in a poorly drained soil, Phytophthora blight, caused by the water mold Phytophthora cactorum, can cause trouble. Infections by this soil-borne pathogen at the soil line are characterized by dark and leathery tissue; eventually the plant or stem may wilt and die. Disease may affect the roots as well. If spores are splashed onto above-ground plant parts they can also become infected. Once infected, the only solution is removal of the plants. Avoid planting in poorly drained sites. Peonies are susceptible to the common problem of powdery mildew. The fungus responsible is Erisyphe polygoni. Powdery mildew has been increasing in occurrence on peony over the past several years. While unsightly, this disease, characterized by a white fungal coating or growth on leaf surfaces, does not typically affect the health of the plant significantly. Because of this, no control products are usually required. Discourage disease by planting in full sun and spacing plants to allow for air flow that minimizes humidity. There are two fungi that can cause stem rot, typically near the soil line, on peony. These diseases, white mold (Sclerotinia sclerotiorum) and southern blight (Sclerotium rolfsii) both result in stem wilt and death. In moist conditions, both may produce visible white fungal growth near the soil line or on infected plant parts. In white mold, black sclerotia (tiny, hard fungal resting structures) are produced within killed stems. In southern blight, tan to reddish brown sclerotia are formed on surfaces. Sclerotia can survive in soil for many years. In addition, both these fungi have broad host ranges. Remove infected plants and select non-hosts as replacements. Fungicides are not typically recommended in the landscape. Peonies are hosts of Verticillium wilt caused by the fungi Verticllium albo-atrum and V. dahlia. These fungi are soil-borne and infect the plant via the roots. Once they enter the plant growth occurs in the xylem (conducting tissue for water and nutrients). As a result of infection and the plants’ response, the xylem becomes plugged, restricting movement of water and nutrients. This results in wilt, lack of nutrients and poor growth. Check for Verticillium wilt by cutting a symptomatic stem longitudinally and looking for streaks of brown discoloration. Remove and discard infected plants and replace with a non-host. There are several viruses that can infect peony. The symptoms may include dwarfing, abnormal growth forms, or distinctive yellow mottling, mosaic or ring patterns on the leaves. Viruses are spread by vectors (insects and others) or mechanically by movement of sap from one leaf to another (i.e. when they rub together). If growth and plant vigor don’t seem impacted by this, no action is necessary. Poorly growing plants should be removed and discarded. Ants are common visitors to peony flower buds and their presence does not necessarily mean there are scales. They are attracted to sugary droplets on the exterior of the buds called extrafloral nectar or the honeydew secretions from scale insects and do not cause any harm to the plant. Foliar nematodes are microscopic worm-like pathogens that feed within the leaf tissue. They move from one feeding site to another when leaf surfaces are wet and go in and out of the leaves through the stomates (pores). Their movement within the leaf is restricted by the veins, resulting in areas of discoloration and dead tissue that are vein-delimited. Control measures include keeping leaves dry as much as possible, removing infested leaves, and using insecticidal soap products. Scale insects look like little raised bumps on the plant. These insects select a permanent feeding site in the early stages of development and feed by withdrawing plant cell contents or sap through piercing and sucking mouthparts. Large populations can weaken plants. In addition, some produce honeydew, a clear excrement high in sugar. This is attractive to ants that feed on the honeydew. Thrips are narrow, tiny insects which may damage buds and leaves with their piercing and sucking mouthparts. They can vector some viruses. Insecticidal soap can be used for thrips but thorough coverage of leaf undersides and crevices is needed because these products must coat the pest to kill it. A strong spray of water may remove many thrips. In addition, many naturally occurring predators help keep populations under control. To preserve these beneficials, only use insecticides when absolutely necessary and never during bloom to protect pollinators. See the UConn Home & Garden Fact Sheet Insecticides: Low Toxicity Options for additional information. Samples of troubled plants or insects may be submitted to the UConn Plant Diagnostic Laboratory for diagnosis or identification.